FARGO, N.D. — With a U.S. Senator and a member of the 3,000 hit club making up two members of the sellout crowd of 4,391 fans at Newman Outdoor Field Friday night for the first game of a three-game series against the Cleburne Railroaders, the RedHawks gave up six runs in the final three regulation innings and another three in the tenth to hand the visitors a 9-6 win. Fargo-Moorhead rallied in the ninth trailing by two to score the runs necessary to force extras, but the RedHawks batters couldn’t summon the same magic in the extra frame. A 1-2-3 inning for Cleburne reliever Shawn Blackwell clinched the Railroaders’ victory and earned Blackwell the save. 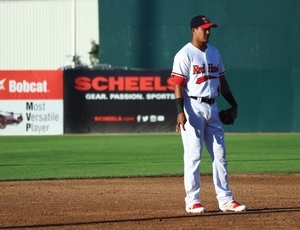 The extra-inning loss drops the RedHawks’ record in games that go past nine innings to 1-2. The RedHawks got on the board first after manufacturing a run from a lead-off hit batter. Maikol Gonzalez reached second on a wild pitch, third on a sacrifice bunt by Yhoxian Medina, and scored on a single from Tim Colwell. Leo Pina hit a solo homer over the left field wall with one out in the sixth inning to double the RedHawks lead. The roundtripper was Pina’s first hit in his first game back after missing four games with an ankle injury. Cleburne got on the board with a long ball of its own in the top of the seventh inning. Hunter Clanin’s shot to left cut the Railroaders’ deficit to one run with two innings to go. Fargo-Moorhead responded in the bottom half of the seventh by loading the bases with nobody out and proceeding to score x runs. A lead-off walk and back-to-back singles loaded them up for Brennan Metzger. Metzger’s RBI fielder’s choice scored Maikol Gonzalez and Devan Ahart followed that up with an RBI single to center, scoring Yhoxian Medina from third. The two runs would prove vital as Cleburne rallied for two runs in the eighth to get back within a run. An RBI double for Trevor Sealey and a sacrifice fly from Angelo Gumbs was enough for the Railroaders to cut the RedHawks’ lead to 4-3. Anthony Pacillo and Geoff Broussard each came on to face one batter in the inning, and they struck out and induced a fly out, respectively, to end Cleburne’s chance in the inning. Cleburne rallied to score three runs in the top of the ninth against Randy McCurry after McCurry came on to try and get the save. A lead-off single, a wild pitch, a hit batter, and a two-run triple from pinch hitter Cameron Monger tied the game before Railroaders first baseman Levi Scott brought Monger in with a single to right field to give Cleburne the lead. With their backs against the wall, the RedHawks sent eight guys to the plate and brought in the necessary two runs to tie the game thanks to two hits and three errors by Railroaders fielders in the bottom of the ninth. Unfortunately, Keury De La Cruz popped out to short and Charlie Valerio grounded out to second with the bases loaded and the winning run on third. The Railroaders clearly had hit their stride in the tenth inning. Cleburne brought in three runs against Benji Waite to take the 9-6 lead that would clinch the win. Tonight’s game marks the halfway point in a 10-game homestand at Newman Outdoor Field. The RedHawks will continue their series against the Railroaders tomorrow night at 6 PM.